The Prime Minister today said the Judiciary should be both "Sashakt" and "Samarth" – empowered and capable – to play its "divine role" of ensuring the rule of law, and delivering justice to the common man. Addressing the Joint Conference of Chief Justices of States and Chief Justices of High Courts, the Prime Minister said that while the executive is under constant assessment and scrutiny in public life, through various institutions, the Judiciary normally does not face any such scrutiny. He said the Judiciary has built up an enormous faith and reputation among the people of India, and should evolve its own in-built systems for self-assessment, so that it can live up to the high expectations placed on it by the people. The Prime Minister, said good infrastructure for the Judiciary was a priority for the Government, and an amount of Rs. 9749 crore had been earmarked for strengthening the Judiciary under the 14th Finance Commission. He said that under the Digital India Programme, technology should be deployed to bring about a qualititative change in the Judiciary. He stressed that quality manpower was required for the Judiciary. He was as concerned about the Human Resource, as he was about the physical infrastructure, the Prime Minister added. Without going into the details of pendency in litigation and corruption in the Judiciary, the Prime Minister hoped that this forum would suggest some fresh approaches to deal with these issues. He said Lok Adalats were an effective way of dispensing justice for the common man, and this mechanism should be strengthened further. Similarly, he stressed the importance of "Family Courts." He also called for a comprehensive review of the system of Government-appointed Tribunals, to assess their efficacy and effectiveness. The Prime Minister said laws are sometimes not drafted well, and therefore lead to multiple interpretations. He said there should be minimum grey areas, and therefore, drafting of laws requires special attention. He said he is committed to removal of obsolete laws. He stressed the need to prepare for emerging areas of litigation such as maritime law and cyber crime. He said acquaintance with forensic science is now a must for those associated with the legal profession. The Chief Justice of India, Shri H.L. Dattu, and the Union Minister for Law and Justice, Shri D.V. Sadananda Gowda, were present on the occasion. The Prime Minister, Shri Narendra Modi has paid homage to Mountaineer Malli Mastan Babu. "The accomplishments of Malli Mastan Babu will be remembered with immense respect and admiration. Condolences to his family", the Prime Minister said. The Prime Minister, Shri Narendra Modi has given the Easter greetings to everyone. "Easter greetings to everyone. May this day further the spirit of harmony and brotherhood in society. The teachings of Jesus Christ inspire entire humanity. Let us pledge ourselves to create a world that is just, compassionate and joyful", the Prime Minister said. The Government of India has released more than Rs.37,420 crore to all the States for Financial Year 2015-16 as the First Installment of devolution as per the 14th Finance Commission (FFC). India is hosting the 5th meeting of the SAARC Health Ministers at New Delhi on 8 April, 2015. Shri J. P. Nadda, Union Minister of Health & Family Welfare, will chair the meeting of the SAARC Health Ministers. Mr. Firozuddin Feroz, Minister of Public Health, Government of Afghanistan; Mr. Zahid Maleque, MP, State Minister for Health & Family Welfare, Government of Bangladesh; Mr. Lyonpo Tandin Wangchuk, Minister of Health, Royal Government of Bhutan; Mr. Ahmed Zuhoor, Minister of Health, Government of Maldives; Mr. Khaga Raj Adhikari, Minister of Health & Population, Government of Nepal; Ms. Saira Afzal Tarar, Federal Minister of State for National Health Services, Regulation and Coordination, Government of Pakistan and Dr. Rajitha Senaratne, Minister of Health & Indigenous Medicine, Government of Sri Lanka will participate in the meeting. Prior to the Health Ministers’ meeting, the 7th Meeting of SAARC Expert Group on HIV/AIDS, 5th Meeting of the SAARC Technical Committee on Health and Population and the 5th Meeting of the SAARC Senior Officials (Health Secretaries) will be held during 6-7 April, 2015. The meetings are being organized in pursuance of decisions taken by the SAARC Summit of Heads of State or Governments held at Kathmandu in November, 2014. Approximately 50 delegates from all SAARC countries, including India, comprising officials and experts will participate in the technical and official level meetings. The 4th meeting of the SAARC Health Ministers was held at Maldives in April 2012. The meetings, to be chaired by India, will deliberate and provide guidance and a roadmap for strengthening collaboration among SAARC countries on a number of issues and challenges faced by these countries. Some of the prominent health issues to be discussed include prevention and control of communicable and non-communicable diseases, disease surveillance network, health infrastructure, human resources for health, immunization for vaccine preventable diseases, HIV/AIDS, mental health, improving access to medicines and anti-microbial resistance etc. The Health Ministers will also discuss for adoption the ‘Delhi Declaration’ affirming their commitment to work together in identified areas and further strengthen health collaboration with agreed roadmap and timelines. SAARC countries comprising Afghanistan, Bangladesh, Bhutan, India, Maldives, Nepal, Pakistan and Sri Lanka, account for nearly a quarter of the world population. These countries face similar health challenges and issues. The purpose of the meetings is to find out ways and means to synergize collective efforts, share strategies and implement identified best practices to provide better health and a better quality of life to the citizens of SAARC countries. These meetings also signal India’s commitment to promote health cooperation in a more effective manner through the SAARC platform in keeping with the new policy of the Government of India to promote cooperation among the neighbouring countries. The Chief Justice of India Justice H.L.Dattu said efforts are on to see that no court case would be pending for more than five years. He was briefing media persons along with the Union Minister for Law and Justice Shri Sadananda Gowda after the Joint Conference of Chief Ministers of States and Chief Justices of High Courts today and the earlier two day working sessions in New Delhi this evening. He said efforts are also on to see that the maximum life of a case is not beyond two (2) years. Justice H.L. Dattu said the idea of Morning as well as evening courts, uniform policy for the selection of Judges across the country and provision of uniform retirement benefits for the retired judges of High courts were all discussed. In addition the speedy judicial process cases relating to women harrasment, juveniles, disabled persons and senior citizens also came up for discussion. He called for increase in number of judges to tackle the problem of pendency. Shri Sadananda Gowda said a continuous dialogue should prevail between the high courts and the concerned states for sorting out problems relating to Judicial administration. The minister referred to Prime Ministers speech delivered earlier in the morning wherein, he said the Judiciary should be both "Sashakt" and "Samarth" – empowered and capable – to play its "divine role" of ensuring the rule of law and delivering justice to the common man. Union Minister of Law and Justice Shri D.V. Sadananda Gowda earlier reiterated the commitment of the government to improve the ease of doing business. He said that the judiciary had risen up to the occasion by commencing the establishment of commercial courts at High Court as well as district-court levels. He informed that significant investment has been made by the Central Government in the justice sector. The country today has more court halls then the total functioning courts. Almost 96% of the district and subordinate courts have been computerised and are providing case information to litigants and lawyers online through the district court websites. With the increased devolution of funds to the States by the 14th Finance Commission, to the tune of of Rs.9749 crore States should improve the justice delivery system. He also offered to make himself available for discussions with the Chief Ministers as well as the Chief Justices of High Courts to carry forward the efforts to provide litigant friendly environment in courts and to eliminate the long-pending arrears of cases in courts. Today’s Deliberations were inaugurated by the Prime Minister and were chaired by the Chief Justice of India Shri H.L.Dattu wherein 21 Chief Ministers and Chief Justices of all the 24 High Courts contributed their ideas and suggestions. 18 agenda items were the basis of discussions in the working session including infrastructure and manpower for courts, judicial reforms, ICT enablement of courts, reduction of arrears and expeditious case disposal, role of the justice system in the ease of doing business, implementation of recommendations of the 14th Finance Commission for the justice sector, drawing up a National Vision and Mission Plan for 2015-2020 and strengthening of legal aid services, judicial academies, juvenile justice system and alternate dispute resolution mechanism. Service conditions of sitting and retired Chief Justices were also discussed. Some Chief Ministers requested that Hindi and other regional languages should be allowed to be used in proceedings in High Courts. In his welcome address Union Minister of Law and Justice Shri D.V. Sadananda Gowda said Indian judiciary has played a key role in upholding the fundamental rights of the citizens as enshrined in our Constitution. However, ensuring justice to a population of over 1.2 billion people is a herculean task. It is more so in a developing economy with vast geographic, cultural and socioeconomic diversity. This makes it all the more important for State Governments and High Courts to work jointly towards the effective administration of justice. The Minister said our judicial system is under strain today due to 3 crore cases pending across the courts in the country. Increasing the number of courts and judges at all levels is the first step towards achieving timely delivery of justice. Development of good judicial infrastructure is another priority area. By creating a favourable working environment for judges, lawyers and litigants, we can make justice more easily accessible to everyone. The Central Government has been releasing funds for this purpose through a centrally sponsored scheme for infrastructure development and has just completed the first Phase of an ambitious eCourts Project for ICT enablement of courts. Shri Gowda said that these initiatives have resulted in availability of more court halls than functional courts in the country; another 2500 court rooms are under construction. The e Courts Project has already computerised more than 13000 district and subordinate courts. Data relating to 4.4 crore cases in these courts is available for the lawyers and litigants to access through the district court website at their convenience. Looking at the positive experiences from these initiatives, He called upon all the Chief Ministers and Chief Justices of High Courts to recruit more judges and staff and provide manpower and extend financial support for maintenance of this ICT infrastructure. He said Government has taken many steps to popularize alternate dispute resolution (ADR). More than Rs 350 crore has been released under the 13th Finance Commission to set up ADR Centres and train mediators. About Rs 140 crore has been released for training of Judicial Officers, and another about Rs 68 crore for training of public prosecutors. We hope to amend the Arbitration and Conciliation Act, 1996 soon to make the arbitration process more investor-friendly, cost effective and suitable for expeditious disposal of cases. Our goal is to make India a hub of international commercial arbitration, the minister said. Shri Gowda said he has written to all the High Courts and State Governments asking them for their views on the recommendation of the Law Commission for enactment of an enabling law to be used for the timely and effective resolution of commercial disputes. In his presidential address Chief Justice of India Shri H.L.Dattu hoped that today’s dialogue between the Judiciary and the Executive will find deep and firm roots in the bond of trust, faith , which is shared between these two institutions. Shri Dattu said the ultimate goal of all of us is to serve the people of India upholding the letter and spirit of the Constitution. We are bound by the constitutional values and principles of Democracy and it is our sacrosanct duty to uphold them. Our sacred Constitution draws its force and its authority from the people of India, but it places the onus and the duty of protecting these citizens on the three pillars of Democracy- the Legislature, the Executive, and the Judiciary, the Chief Justice of India asserted. Shri Dattu said as judges are guardians of the rule of law and the Executive has an equally important role in facilitating a rule of law society. He said, it is in the highest traditions of democratic governance that two branches of the State- the Judiciary and the Executive have come together to communicate directly with each other. Shri Dattu said must remember that the Framers of our Constitution- the women and men who penned down the voice of our Mother- established the Supreme Court primarily for the purpose of being the interpreter and the guardian of the many salutary principles that they had enshrined within the Constitution. The initial deliberations of the Assembly in this regard were almost wholly devoted to formulating its role as a Constitutional Court and the extent of its original jurisdiction. It was only later that the Framers turned their attention to the appellate jurisdiction of the Supreme Court. Similarly, the High Courts of the States have also been given an essential constitutional role. Shri Dattu said every Chief Justice of India has significant opportunities along with the responsibility and privilege to shape the administration and access to justice in this country. He termed Chief Justices Conference over the last two days and the Conference today as a significant moments in his tenure where they all had an the opportunity to collectively define the contours of our justice administration system. He said the ways and means to tackle the pendency in the Courts, modernization of our legal system and responding to the current needs of society. He said the very heart of the justice administration in this country, which cannot be solved by the judiciary alone as it requires the active cooperation and assistance of the Executive. The issue of pendency requires efforts on multiple fronts from multiple agencies to effectively address this issue. Above all, it requires tremendous investment in developing appropriate infrastructure for the judiciary, police, prosecution agencies etc. Shri Dattu said Supreme Court and the various High Courts have been taking a wide range of measures to address pendency and this can be seen in the reduction of the pendency in the Supreme Court in the last few months and the effective lok adalat measures that have been taken across the nation. To further intensify these efforts, Arrears Committees are being constituted in every High Court to develop a strategy to clear backlog of cases that is relevant to local contexts. He said we have been able to address the long pending matters pertaining to Land Acquisition, Direct Tax cases, Criminal cases and Service matters. Shri Dattu referred to the strengthening of the Judicial Academies and emphasized that regular training and education of not only Judicial Officers, but also of lawyers is the need of the hour. He said we need to encourage arbitration, mediation and conciliation as genuine modes of dispensation of justice. Further, there have been concerns that highly able and competent lawyers generally do not venture into the field of legal aid. It has been suggested that to attract the best minds, it would be necessary to increase the monetary benefits attached to the same. Shri Dattu also stressed on ensuring the best minds to adorn the Bench and vouched for attractive re-numeration as in future if youth does not see this Judiciary as a financially viable career option, it may choose to stay away from the same. If one were to simply compare the salary and perks of sitting Judges in India to any other modern Democracy, or even compare the same to that of fresh graduates in Indian Law Firms, the stark reality would be evidentHe said this would cause the greatest hindrance in attracting the competent youth towards the Judiciary. Shri Dattu reffered the Judiciary and the Parliament as siblings- the children of Democracy and said we are obligated on one hand to support one another, and on the other hand correct the other if they sway from the path laid down by our sacred Constitution. He further hoped that today’s discussions will help us take significant steps towards achieving a dream that our constitutional drafters held very dear. He said working towards a truly just and effective administration of justice in a country like ours requires tremendous courage, commitment and creativity. He also quoted Rabindranath Tagore: “Let us not pray to be sheltered from dangers but to be fearless when facing them”. And hoped that that the citizens of this beloved Country are assured “Justice” to its fullest extent - A hope which can only be achieved through mutual respect and cooperation- A hope that the path to justice is no longer a fight, but a matter of right. The Conference is expected to come up with definite outcomes in the form of resolutions for implementation by the judiciary and the Central & State governments. At the conclusion of the working sessions, the Chief Justice of India and the Minister of Law & Justice are to brief the press/media at Vigyan Bhawan, New Delhi today about the deliberations and decisions taken at the conference . Union Minister of Science and Technology and Earth Sciences and Vice-President, CSIR Dr Harsh Vardhan, has said that Aerospace and Defence have been identified to be at the heart of ‘Make in India’. Addressing scientists of National Aerospace Laboratories of CSIR on his visit to Bengaluru today, he urged them to work hard to make the Prime Minister’s ‘Make-in-India’ programme a success. He said with its more than five decade experience of providing indigenous technologies to these strategic sectors, CSIR-NAL is uniquely poised to underpin Prime Minister Narendra Modi’s call to raise the percentage of domestic procurement from 40% to 70% in next five years. Dr Harsh Vardhan pointed out that Aerospace and Defence is globally, a very highly competitive area, defined by technology denial regimes and highly proprietary systems. Further, he remarked that aerospace is an area marked by large investment and long gestation periods but nevertheless it is imperative to develop streams of innovation that provide significant long-term payoffs in terms of import substitution as well as cutting-edge technologies. He observed that it was this far-sightedness in supporting aerospace R&D with the establishment of CSIR-NAL in 1959 that resulted in its key technology successes for the strategic sector like carbon fibre composite airframe components and Fly-by-wire Flight Control systems for the Tejas light combat aircraft programme which were all denied under the technology control regime. The Minister, who was accompanied by Dr M.O. Garg, Director-General, CSIR, and Shri Shyam Chetty Director, NAL, visited various laboratories in CSIR-NAL which included the Advanced Composites Division, Acoustic Test Facility (ATF), National Trisonic Aerodynamic Facility (NTAF), Micro Air Vehicle Aerodynamics Tunnel and the SARAS Flight Simulator. At the ATF and NTAF, he recognised CSIR-NAL’s efforts towards India’s space programme, the latest being acoustic qualification of subsystems for GSLV-D5 and the aerodynamic characterisation of the LVM3 launcher. 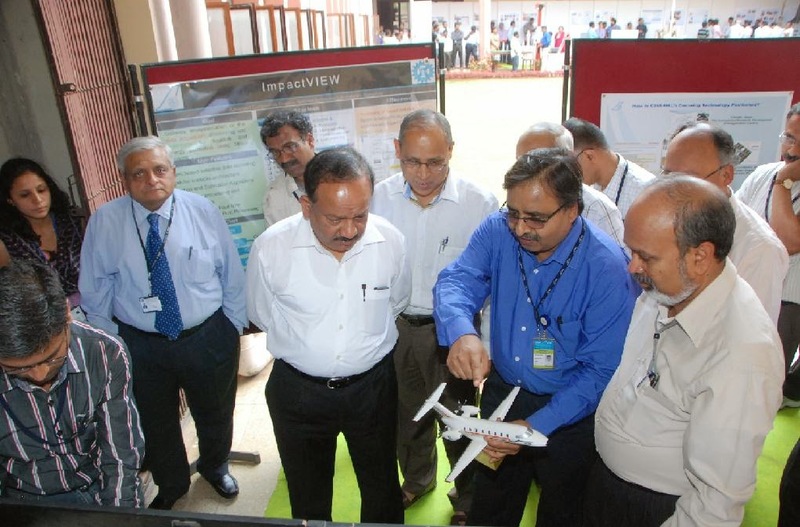 Dr Harsh Vardhan complimented the scientists and staff on the numerous spin-off products developed including India’s largest Autoclave for Airworthy Composite Processing, the first indigenous transmissometer (DHRISTI) for measuring runway visibility, the first indigenous Electronic target (DHVANI) for the Indian Army, Active noise control, smart materials and surface modification. Such spinoffs demonstrated out-of-the-box thinking and were imperative for the Prime Minister’s ‘Make-in-India’ program he said. Remarking on the need for inclusive innovation, he commended CSIR-NAL technologies that have significant societal impact such as solar selective coating for industrial and domestic solar water heaters, coatings to enhance tool wear resistance and wind–solar hybrid wind turbine system to power off grid remote areas. He congratulated CSIR-NAL on its many laurels, the latest being the “Best Laboratory Award 2014”, from Brahmos Aerospace, for its breakthrough technology development and outstanding contributions. These awards were a testimonial to the sincerity and commitment of the scientists who persevered despite the well-known challenges in aerospace. As the only aerospace laboratory in the civilian sector, he appreciated the efforts of CSIR-NAL towards civil aircraft development starting with the 2-seater HANSA in 2000, the 14-seater SARAS in 2004 and the 5-seater CNM-5 in 2011 which has the distinction of being the country’s first public-private partnership (with Mahindra Aerospace). He emphasised the need for increased linkages with private industry that would enable quick commercial realisation of the developed technologies.He met with the representatives of private industry as well as various government organisations supported by CSIR-NAL and called for greater synergy towards meeting both strategic goals as well as spin-off civilian products.